“SELL YOUR OWN DAMN MOVIE!” IS IN TOP 1% OF AMAZON SALES! Troma Entertainment, Inc. is proud to announce that Lloyd Kaufman’s latest text book “Sell Your Own Damn Movie!” has cracked the top 50,000 best-selling books on Amazon.com! In the book, the 4th volume in the “Your Own Damn Film School” series, published by Elsevier/Focal Press, the President of Troma Entertainment and Creator of the Toxic Avenger reveals the secrets of how he and Troma have been selling their movies for 40 years. About half of “Sell Your Own Damn Movie!” also includes interviews and sidebars from SUCCESSFUL filmmakers and distributors. The book features insights from David Cronenberg, director of “The Fly”, Oren Peli, producer/director of “Paranormal Activity”, James Gunn, writer/director of “Super”, Brad Kembel, distributor of The”Twilight” films and Ted Hope, producer of “Crouching Tiger Hidden Dragon”. “Sell Your Own Damn Movie!” is currently available for purchase at all Barnes and Noble stores, www.troma.com, Amazon.com, and wherever fine books are sold! 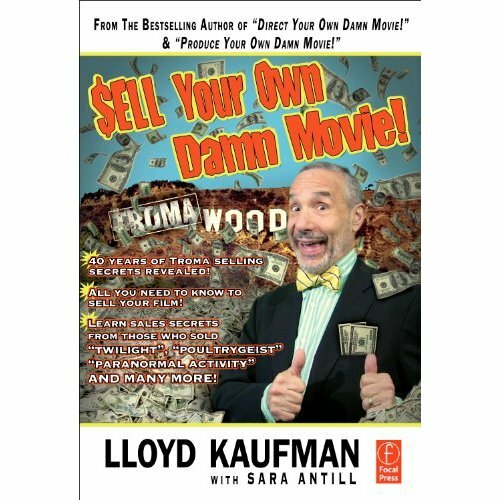 Additionally, on the evening of July 6th, 2011, Lloyd Kaufman will be discussing and signing “Sell Your Own Damn Movie!” at the Strand Bookstore in New York. All the living Beatles will appear with him. This entry was posted on Friday, June 24th, 2011 at 9:32 am	and is filed under News. You can follow any responses to this entry through the RSS 2.0 feed. You can leave a response, or trackback from your own site.